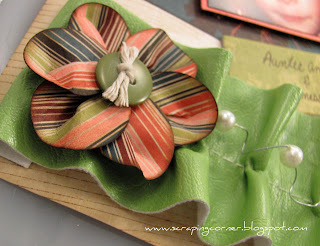 Here is a tutorial on a flower I have recently made - I've been calling it a "water flower" but it would more accurately be called a Circle Punch flower. I was calling it water flower because you use a water mister to make the petals wet so they are malleable. Step OnePunch 7 circles. Six will be the petals, one will be the base. Mist the 6 circles with water, then ink with distress ink on the edges. 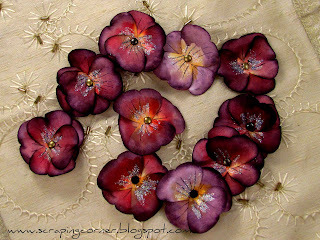 Remember that Distress ink reacts to water, this gives a neat effect on the petals. Fold a pleat into each of the six moist circle petals and secure with a staple at the base of the pleat. 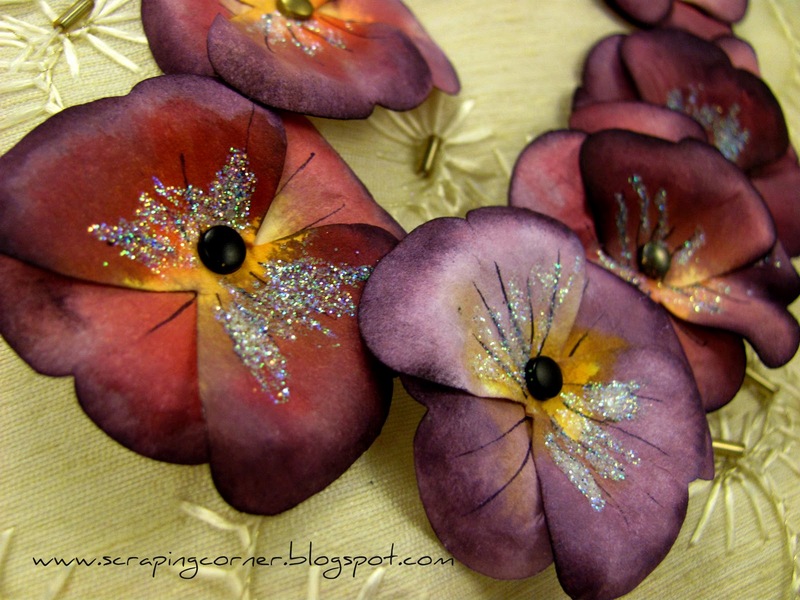 Staple each of the petals onto the base circle. Work in a clockwise fashion overlapping the previous petal. Create a centre to your flower. You can use a large brad or I have used buttons with twine. Voila, you now have a pretty little dimensional flower! Another layout using the Bo-Bunny Olivia collection; This one I didn't title (titles are so over rated sometimes aren't they?) 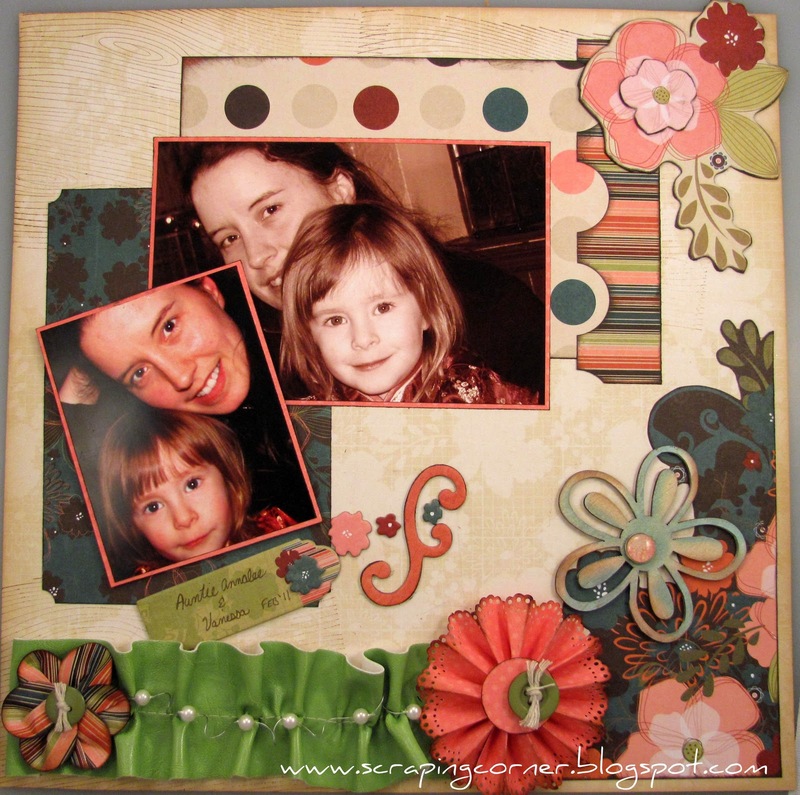 These photos are taken the same night as my other layout, again they are my sister and this time with my daughter. I used the Bo Bunny Wraps again, and since I didn't know what to do with the 'leather' trim that they have in the collection, I did a gather stitch on the sewing machine and hoped that it doesn't look too out of place. I tried two new techniques on some flowers; the flower on the bottom left I'm calling a "water flower" and it is 7 circles punched, then you dampen with a mini-mister of water and make a pleat into the bottom. I inked with distress ink while still wet, then allowed it to dry. I then hot glued the petals to the 7th circle overlapping he petals for a dimensional look. 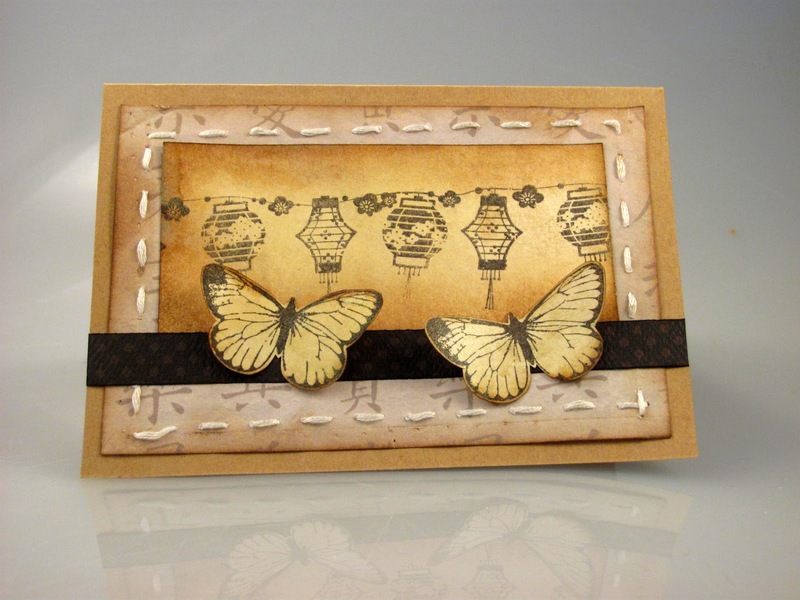 I used another of the Kaisercraft wood laser cut flowers, and agian glimmer misted it. The third flower (coral) was made by using a edge punch and then pleating the paper, again hot glue to hold down the centre and added another circle to the middle for the centre. I used a new background stamp that I got from Stampin Up just to try it out (wood grain) and I will definitely use that again, I love how it turned out|!| Some chip stickers and Basic Grey buttons and away you go! If you want to see either of these Bo Bunny Olivia layouts in person, head on over to Auntie Em's Scrapboooking! I'm really loving the colours in the Olivia Collection by Bo Bunny. 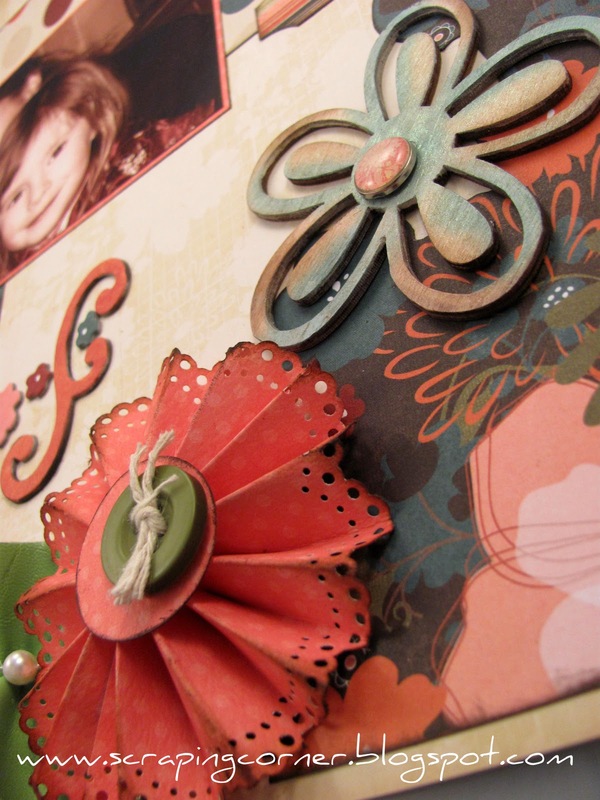 I've always liked coral and teal together. 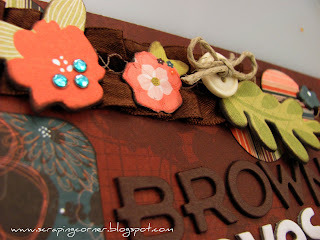 Mix in some rusty brown and I'm even happier! 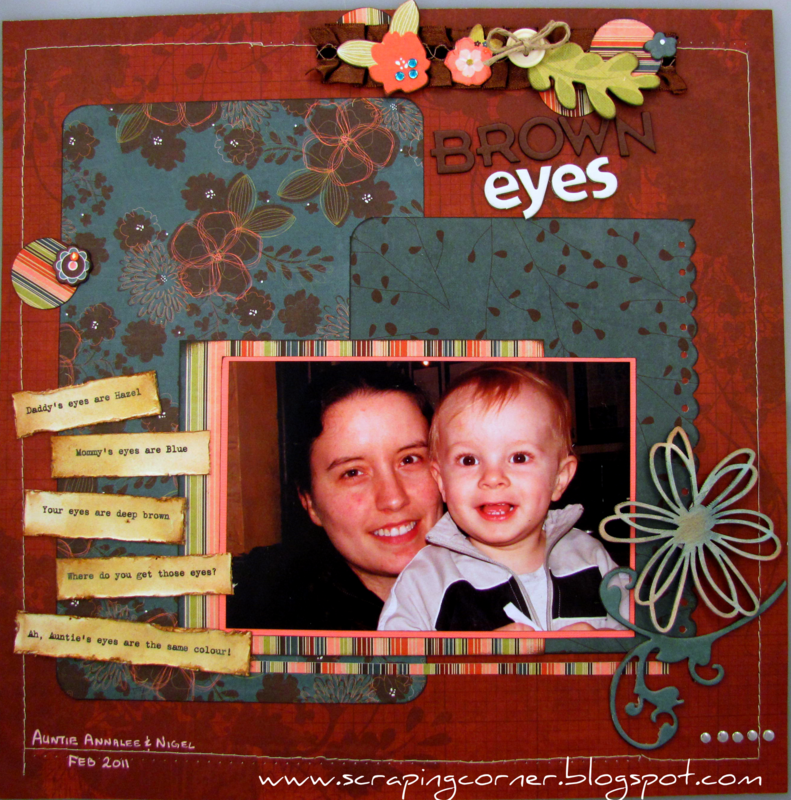 The photo in this layout is of my sister and my son. I chose to focus in on their eyes. Both of them have brown eyes - and such a deep brown too. My husband nor I have brown eyes, but Nigel got his brown eyes from my Father's side of the family - as did my sister. What a great shot of the two of them! I used Bo Bunny's Wraps trim in the top, and chipboards. The wooden flower is Kaiser Craft that I glimmer misted. The letters are Basic Grey. 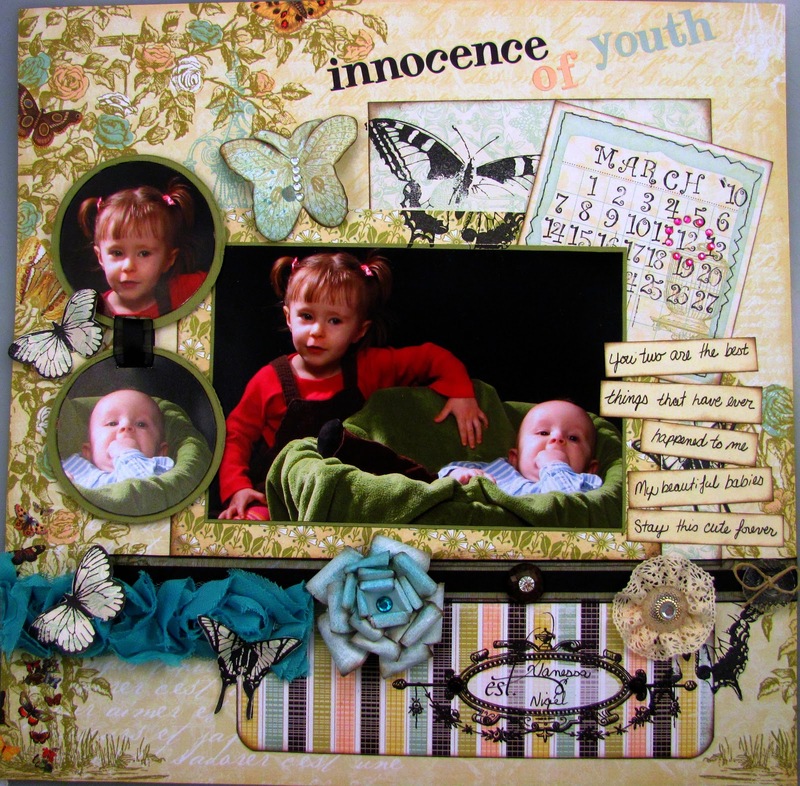 I used my I-rock on the flowers and in the bottom right corner. The journaling a printed on my computer with ﻿Vintage Typewriter font, and I distressed with Vintage Photo ink and Wheatfields gimmer mist. The button is Bo- Bunny as well, it came on the trim! "Daddy's eyes are hazel, Mommy's eyes are blue, Your eyes are deep brown, Where do you get those eyes? Ah, Auntie's eyes are the same colour!" Believe it or not ... the date at the bottom is NOT written in PINK - for some reason the white Signo ink turned pink on this page after I wrote it ... I'll have to remember that if I ever actually do want pink ink!! Here are a few cards and a layout that I've been working on recently. 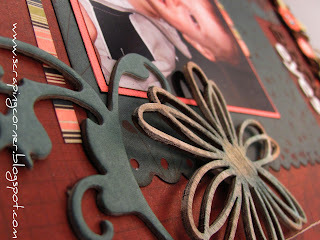 The story behind the layout it that I don't know a THING about Harry Potter - not a dang thing, and when I started working with this lovely collection of Harry Potter papers and embellishments, I had no clue what to do with it. Don't get me wrong, the paper is lovely - all antique like and my colours too. The only thing I know that is associated with Harry Potter is the word "Muggles". You see my husband and I Geocache - that is, we use a GPS to plug in latitude and longitude co-ordinates and play a game of "hide and seek" looking for a 'cache' that is filled with trade able trinkets and a log book. It is a great outdoor adventure that takes you to places that you likely wouldn't have traveled to if not for hunting for 'tuperware in the woods'. 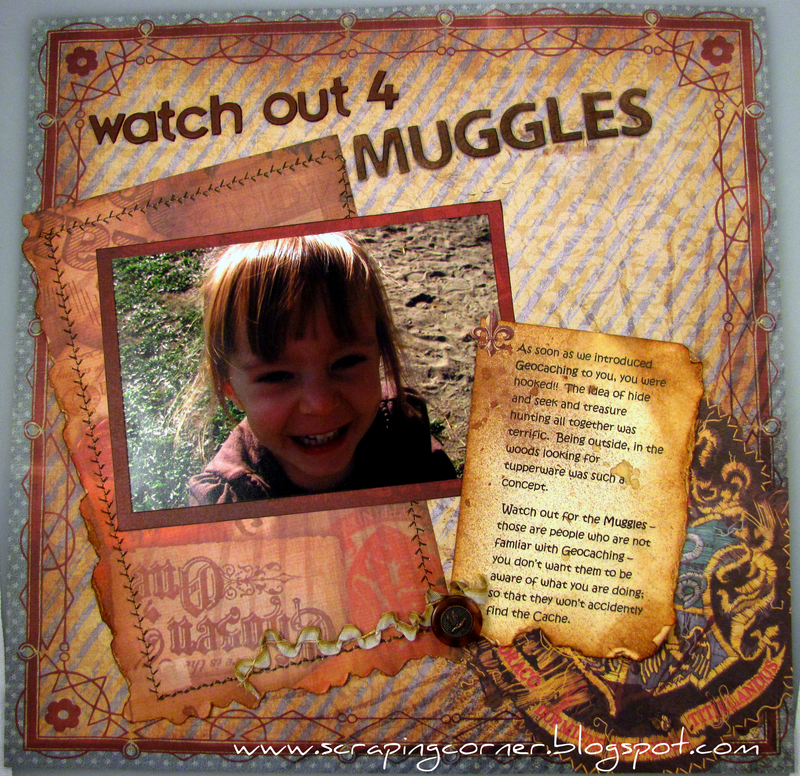 That being said; a Muggle is a person who is not a Geocacher who happens to stumble upon either the cache or you scouring the woods. There you go ... there's the link! So, I used three different papers from the collection for this, and printed my story out on ivory cardstock with the font Kristen using my computer. 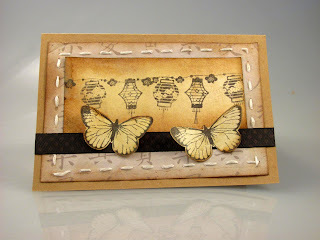 Then distressed the paper and inked with Tim Holtz Distress Ink in Vintage Photo, and used two Glimmer mists; Coffee Shop and Wheatfields. 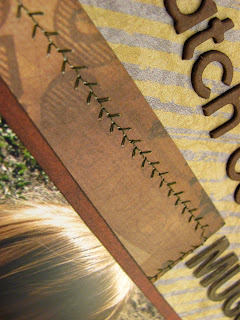 I stitched the one paper with my sewing machine, and distressed the edges with Tim Holtz Distressing ink in Vintage Photo. I The title is Basic Grey Chip letters. The button is a vintage military button from my husband's sewing box. The ribbon trim I'm not sure about the brand. 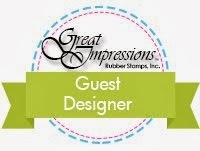 "As soon as we introduced Geocaching to you, you were hooked. The idea of hide and seek and treasure hunting all together was terrific. Being outside in the woods looking for Tupperware was such a concept. Watch out for Muggles - those are people who are not familiar with Geocaching - you don't want them to be aware of what you are doing; so they won't accidentally find the Cache"
Using the Sew Easy tool from We R Memory Keepers I put together the following 3 cards. 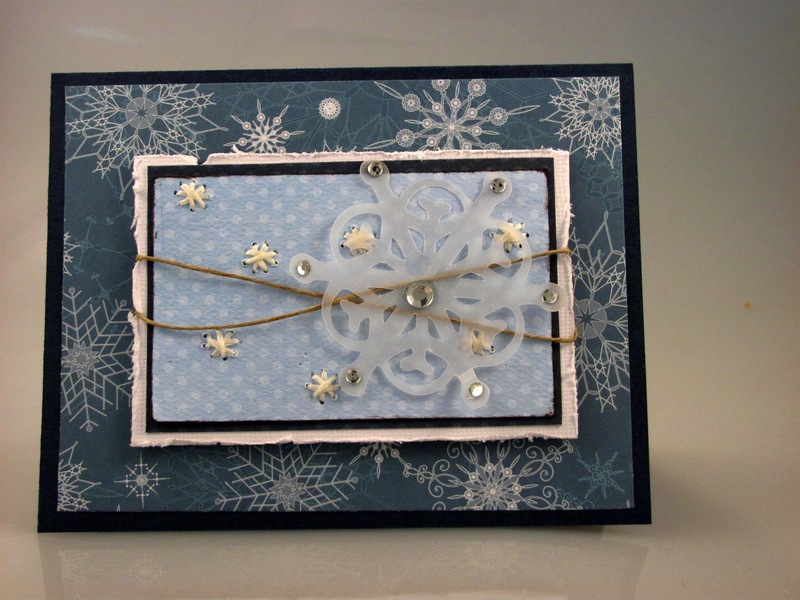 The second card I used a snowflake patterned paper (unknown) and two different Bo Bunny double dot cardstocks and some white Bazzil. 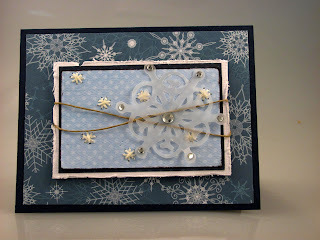 I used the "Burst" wheel on this card and instead of rolling it in a row, I used the burst in the form of snowflakes. 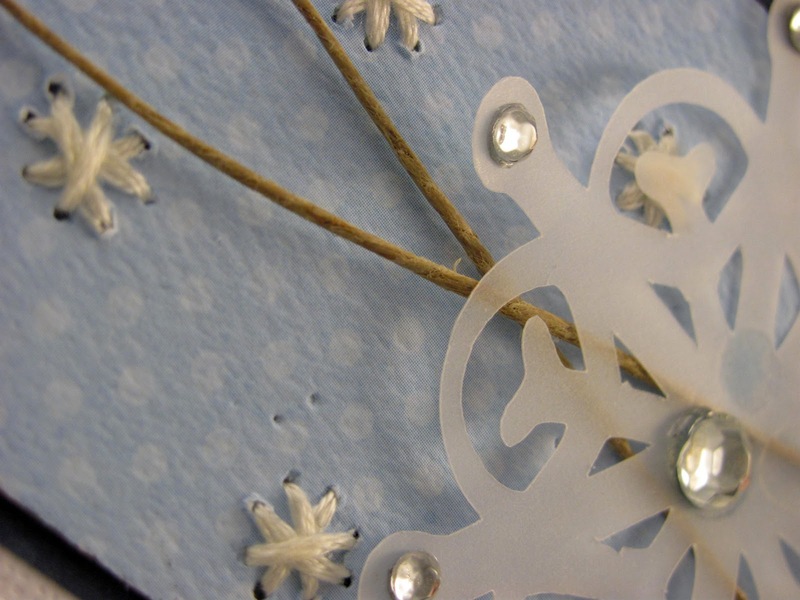 I cut a snowflake with the Cricut (Potpourri cartridge) out of vellum and some hemp string. I use the I-rock gem setting tool for the bling on the snowflake. 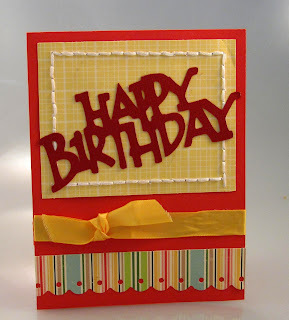 For the final card - Happy Birthday - I used October Afternoon's Thrift Shop collection patterned papers and red Bazzil cardstock. I used the Cricut to cut the Happy Birthday (Potpourri) and a piece of salvaged ribbon from a box of chocolates. In like a lamb ... man it was a beautiful day out there today! Just below freezing, full sunshine, no wind to speak of ... a gentle lamb. I guess we will be in for a Lion in 30 short days! 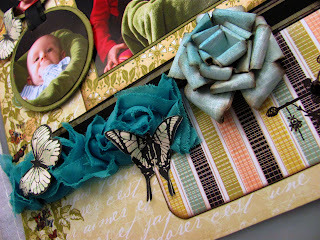 Well, since March is here now, I will give you the reveal of my March project for Auntie Em's Scrapbooking. We got to use some wonderful items from Webster's Pages this month. 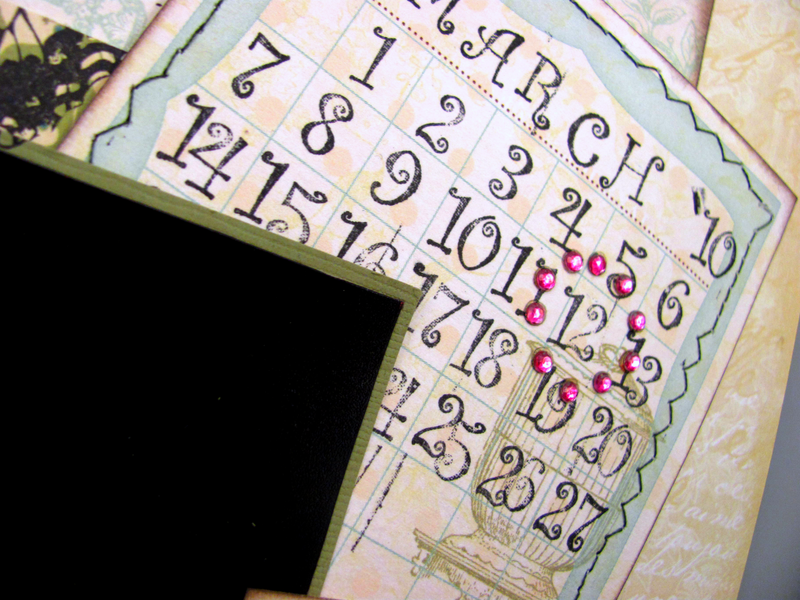 Mellisa and I used the March sketch from the Scrapbook & Cards Today Page Maps calendar as inspiration. It never ceases to amaze me that we can use the same sketch and the same papers and end up with such different ideas. This month again I was stumped at how to use three photos. This whole multiple photo thing is going to either make me snap or make me a better scrapbooker. I hope it's the later, not the former! 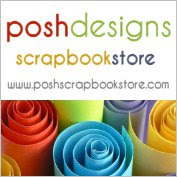 Be sure to check out Auntie Em's Scrapbooking Blog here, and Mellisa's blog here for further details and if you comment here you will have a chance to win some Blog Candy that I'm putting together ... and check out Auntie Em's page, there might even be some Blog Candy over there too!